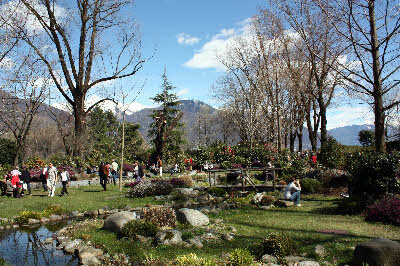 The stunning Camellia Park was inaugurated in Locarno in 2005 on the occasion of the International Camellia Society World Congress (ICS), which was attended by participants from all over the world. During the five years since its opening the park has become an international attraction, thanks both to its landscape value and to its precious botanical features. At the time of the inauguration 500 camellias were planted and the vast number of species present guarantees, in principle, a flowering period of 9 months. The largest flowerbed of the park, dedicated to perfumed species and camellias, has been created next to the amphitheatre, which will enable visitors to sit in the most panoramic point of the area. From the top a small stream runs down to feed the new pond, whose waters reflect an elegant pavilion. 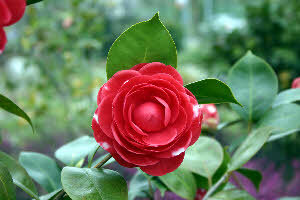 The latter houses a series of information panels on camellias. Today, with the work almost finished, the Park is home to 850 varieties of catalogued camellias including about forty different species and ten perfumed hybrids. In addition to these, there are 70 as yet unidentified camellias, planted at the southern extremity of the public paths and 130 double camellias, which form a dividing hedge and are used mainly to provide cut flowers for the annual show held in spring.